D.J. Balentine, Egidijus Mockevicius, Mislav Brzoja, Jaylon Brown, and Adam Wing combined for 80 of Evansville's 84 points in a 84-65 win over the Drake Bulldogs. In other words, they are ready for Friday's showdown at Illinois State. EVANSVILLE, INDIANA---Denmark versus Lithuania. Reed Timmer versus D.J. Balentine. Drake versus Evansville. To conclude a two-game home stand and lull in conference competition, the Evansville Purple Aces played host to the Drake Bulldogs in another trap-game this evening. Behind another terrific team shooting performance by Marty Simmons' crew (53.3%), Evansville put away the Bulldogs in the second half while notching a 84-65 victory. Landing the first unmatched run with a 6-0 spurt, the Purple Aces jumped out to a quick 10-4 lead with 4 of D.J. Balentine's game-high 24 before the first media timeout. However, Evansville did not swiftly pull away, for a 9-4 two-minute span in favor of Drake, capped off by a Reed Timmer jumper, drew the Bulldogs within one with just over ten minutes remaining in the first half (14-13 UE). Fortunately, for the Purple Aces, following the ten minute mark, everything began to click. It officially started with a David Howard made free throw; although, Blake Simmons really got the party started with his only made field goal, a triple on the following possession. 18-13 Evansville! From the trey by Simmons, the Purple Aces' shooting guards Mislav Brzoja and Adam Wing stole the show with a combined seven straight points to lengthen their advantage to a then game-high 12. Yet, it would only grow from there as Egidijus Mockevicius supplied six in the final 2:37 of the first half to assist his team in taking a 38-22 edge into the halftime locker room. Although an early second half dose of Jacob Enevold Jensen and Timmer drove Drake to the brink of dwindling their deficit under double-figures, UE's Brzoja, by getting to the foul line and netting free throw after free throw, constantly re-upped Evansville's advantage prior to Balentine getting into a groove with eight points in 2 minutes and 30 seconds. 57-36 Purple Aces! While the Bulldogs continued to come sprinting back and were able to chip their opponent's lead down to ten with plenty of time to mount one final comeback (6:36 left in regulation), a combination of Balentine, Mockevicius, and Jaylon Brown, turned the key in the final lock on the dog pen. 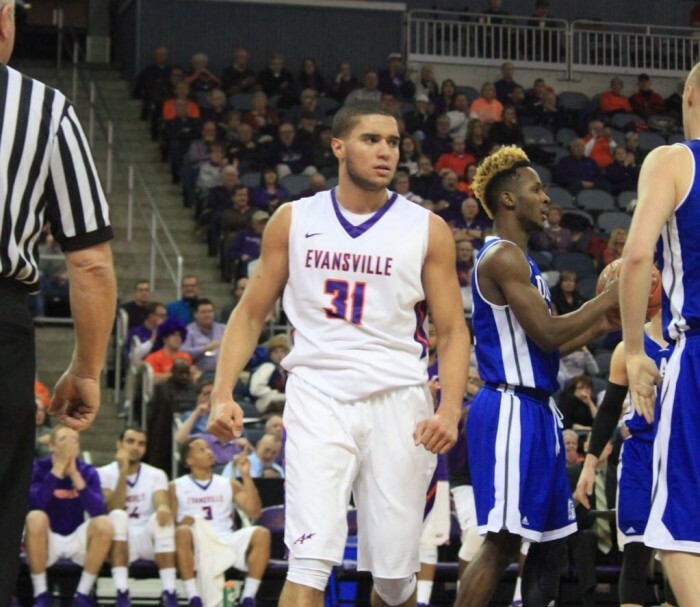 The Evansville Purple Aces were on to Normal, Illinois, with a 4-1 conference record. Leading the nation in rebounds per game (entered with 14.1), Evansville center Egidijus Mockevicius was coming off a very rare poor performance last Saturday against Bradley. How poor are we talking? Despite pulling down eight rebounds, "Iggy" netted a season-low five points. Granted, the contest was in hand by the first media timeout in the second half leading to reduced playing time, but such a stat line was surprising considering the Braves were full of undersized freshmen. Nonetheless, on Tuesday night he redeemed himself. Whereas another subpar performance looked imminent in the first half considering he had two points in the first 16 minutes, the 6'11" Lithuanian finally started his offensive motor with 8 points in the final 4 minutes to increase his total to 10 in the first half. How about the second? Just like a vacuum cleaner, Mockevicius was a monster on the offensive and defensive boards, for he ended with 12 total rebounds. Additionally, he had 21 points and 3 blocks. One of the most under-appreciated players suiting up in the orange and purple for the Evansville Purple Aces is senior Adam Wing. Why? While he is the glue in the middle that keeps the team running smoothly, he normally won't drop twenty or come close to a triple-double, In other words, he does "all the small things." Tonight the 6'4" guard was a true beast on both sides of the ball as he did everything from scoring (9 points) and facilitating in transition (3 assists) to frustrating Drake's second leading scorer Kale Abrahamson. Wing even found Jaylon Brown for an easy layup with a beautiful behind the back pass that had the home crowd on its feet! Without question, Evansville was once again "winging" at the Ford Center. Let's face it, this season has not been pretty for the Drake Bulldogs. But, Reed Timmer's sophomore campaign has been! Timmer, who was named to the Missouri Valley Conference's All-Newcomer and All-Freshman teams last year, was once again brilliant against a very good opponent as he finished the evening with 19 points on a very efficient 6-of-9 shooting night. Of course tonight was no 30 points versus DePaul or 25 at Iowa, but the way the "stud sophomore" continues to succeed against defenses attempting to contain him is very impressive. The 5-12 (0-5) Drake Bulldogs' schedule does not get any easier following this evening, for they will host a Southern Illinois Salukis team who has already defeated Illinois State and Northern Iowa on the young MVC season. "We tried to contest him all the way and tried to make him a no-help guy. We switched some lineups with him and didn't allow him to get easy shots." ---Evansville Purple Aces' Mislav Brzoja on holding Drake's Kale Abrahamson to 5 points, 10 under his season average. "His behind the back passes are--that's him all the time. He is really good at those. He is probably the best on the team. He makes those in practice and he makes those all the time. The fans were shocked but he can make those kind of passes. Very unselfish." ---Evansville "star senior" D.J. Balentine commenting on Adam Wing's behind the back pass in transition to a streaking Jaylon Brown. "I don't. These guys would much rather be playing games than practicing, I can guarantee you that. But no. It is just a good opportunity. Illinois State's got a very good team. They play extremely hard. And they beat us three times last year and they really beat us pretty good up there at their place. We got some work to do. They apply a lot of pressure, and our ability to take care of the basketball will be one of the big keys to the game." ---15-3 (4-1) Evansville Purple Aces' head coach Marty Simmons on whether a unique game day (Friday) at Illinois State will affect his team. VAVEL USA will supply post-game coverage of the Missouri Valley Conference matchup Friday evening.